Nicol Freeman, a three-year member of the Cadets' color guard, sent this photo and caption. 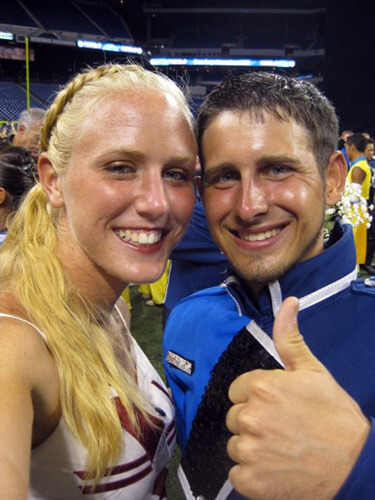 Over the winter I found out that Tom Dubbert, one of my best friends from middle and high school, was marching as a member of the Bluecoats this summer. I saw him only a few times this season, but this photo is one where we got the chance to capture the moment. We'd both marched together in high school and have been playing together since sixth grade. We took this photo together at the Age-Out Ceremony during the World Championship Semifinals in Indianapolis. It was a night to remember for the both of us.